Outdoor projects are calling your name - from windows and siding, to cars and furniture. When it’s time to take on your to-do list, you need reliable, no-fuss equipment that helps you check every box. That’s what the Briggs & Stratton 2800 MAX PSI pressure washer was built to do. 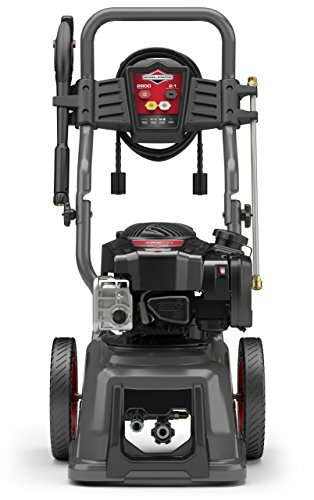 Powered by a Briggs & Stratton 725EXi Series engine, it delivers 2800 PSI of cleaning power - enough water pressure to take on almost any job. Combine that power with the hassle-free convenience of our innovative Just Check & Add oil system and Easy Start pump, to the onboard detergent tank and all-steel base, every feature ensures you spend more time working on your property and less time working on your pressure washer. This unit is certified by the Pressure Washer Manufacturers' Association (PWMA). All water pressure (PSI) and flow rate (GPM) claims for this product were tested and verified by an independent lab, ensuring you take home the power you were promised.